"What a shock, I had just talked with Charlie 3 days before..."
"My God I loved Charlie so long ago So Sorry"
"Ellen, Nicole and all. Your loss is a big one. Charlie was..."
"Ellen, I am so very sorry for the loss of your husband. ..."
"Ellen, We are deeply sadden to hear of Charlies passing. As..."
OAKLAND - Charles M. Clarke, 64, of Oakland, beloved father, husband and friend, passed away peacefully after a battle with many medical complications on Jan. 25, 2019, in Cape Coral, Fla.Charlie was born in Waterville, Maine, to Maurice and Jean Clarke on Jan. 30, 1954. He graduated from Waterville High School in 1972. He married Ellen Jurdak on Jan. 28, 2014, in Naples, Italy. Charlie began as a cook in 1972 at local restaurants in Waterville before starting at Kennebec Supply Co., in 1974. Charlie continued with Kennebec Supply Co. turned F.W. Webb for the following 42 years as an account manager until he retired in 2016. He was known for starting the 110 Yacht Club in Boothbay Harbor, Maine. He was also part of the Boothbay Harbor Country Club where he was employed at the gatehouse welcoming people with a smile and having the opportunity to chat about all he loved.How do you write a tribute to a man as multidimensional as Charlie Clarke?When asking people to describe him, funny, generous, loyal, considerate and fun-loving, are just a few words that were mentioned.Charlie lived a long and full life, filled with laughter, friendships and hobbies. 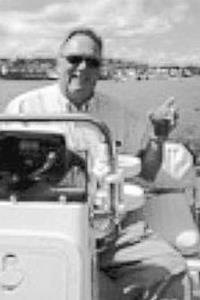 Golf and boating were his absolute favorite and enriched his life year round. When he was not doing one of the above, he was planning for the next trip including his most recent trips to Florida in the winter. He enjoyed his family and his vacations with his wife, Ellen. Cruises and tropical vacations were at the top of his list to enjoy with that one major trip to Italy where he was able to marry his best friend in 2014. Charlie also enjoyed his love of sports which included playing hockey, coaching hockey and watching the Patriot's during football season.Charlie was also known for his teaching of others, his caring for others and of course his sharing of his opinion that everyone was to take as "just an opinion" and not a directive! Looking back we can all agree that those opinions might have just come in handy. Charlie was always there to lend a helping hand to others and many relationships in his life started out due to his kindness. Charlie was also known for his strength as a person and his endurance for difficult things that came his way. He might not have liked daily challenges, but somehow he always found a way through them.Charlie's dying wish was to be remembered for the good times, the positive memories and not the difficult days at the end. He was joking until the very last day, showing his infectious happy spirit that refused to die.What is the best way to remember a man like Charlie Clarke? Close your eyes, think back to the last time he made you laugh and don't let go of that memory. That would have been his wish.Charlie was preceded in death by his father, Maurice Clarke, who passed in 1994, and his mother, Jean Rhodes Clarke, who passed in 1979. He was also preceded by many dear friends who have passed that he respected as family.Charlie is survived by his wife, Ellen Clarke of Oakland, Maine; daughter, Nicole Clarke and fiancé, Michael Foley, of Phoenix, Ariz.; son, Nick Jurdak and wife, Lynn Jurdak, of Oakland, Maine; cousin, Sue Modereger and John Modereger; "brother from another mother," Mike Carey and his wife, Patti Carey; and more friends than the obituary can hold. Charlie had many dear friends that he looked to as his family, who will not go unmentioned or thought of during this difficult time of loss. A special thanks goes out to all of them for their love, support and kindness over the years.Family and friends are invited to attend a celebration of life that will be held from 1-5 p.m. on Feb. 10, 2019, at the Waterville Elks Lodge, 76 Industrial St., Waterville. Arrangements are under the direction and care of Gallant Funeral Home, 10 Elm St., Waterville. An online guestbook may be signed and condolences and memories shared at www.gallantfh.comIn lieu of flowers, please donate to:The Boothbay Region Ambulance FundraiserP.O. Box 280Boothbay, ME 04537,or your local youth scholarship funds.